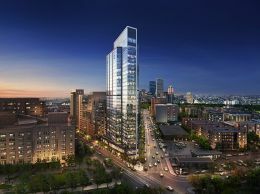 The Whitwell, located in Boston's prestigious Beacon Hill, will be a 14 unit, ultra-luxury, gut renovated condo building. The new construction building features 14 floor-through residences with custom appointed finishes, 3+ bedrooms, 12 ft. ceilings, separate dining and living areas, and floor-to-ceiling windows. Residents will also have direct elevator access to deeded onsite garage parking and a common landscaped terrace with beautiful city views. The penthouse, with private outdoor space, will feature 6,200 square feet, 20 rooms and floor to ceiling windows. Asking price is $13,700,000.